(Pro) Life, Without Religion, Part 1: It’s My Body! This morning Jodi and I saw the face of an angel — our angel, a tiny new Thorplet, just 11 ounces now at 18 weeks of development. Our baby pulled away from the attempts to examine his or her feet, just like all of our children, but otherwise kept uncooperatively still, making it difficult to get a good look at the tiny, chugging heart. When the sonographer was finally finished her thorough examination, she took the photo above: a tired wee child, hand above head, resting peacefully. I’ve always loved ultrasounds. 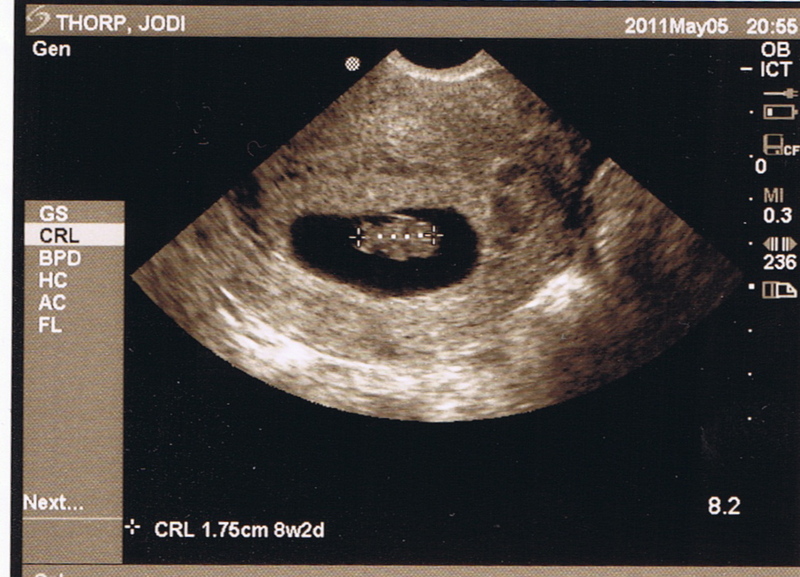 In part, it’s the geeky wannabe scientist in me, but mostly, it’s the wonder and sweet jealousy of seeing our tiny baby alive and safe inside the love of my life, and knowing that yeah, I can pee standing up, but I’ll never feel life moving within me. 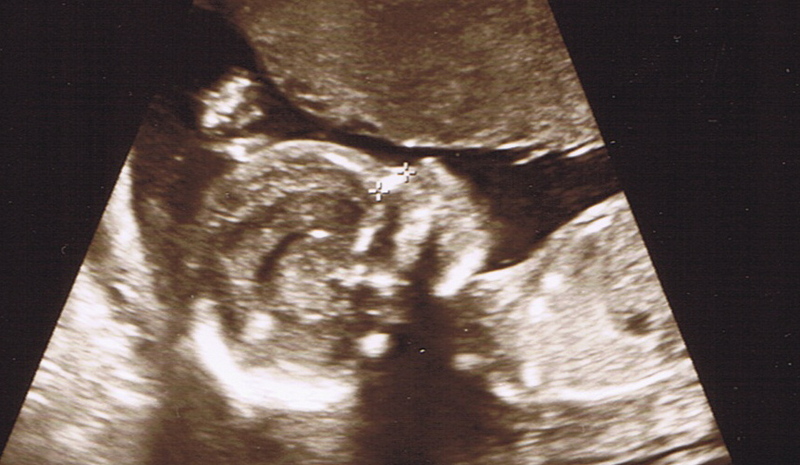 This was a level-2 ultrasound: given my bride’s so-called “advanced maternal age” (I wouldn’t begrudge her a right cross next time someone says that…not this time, but next time…) they offer it as a way of taking a closer look at how both the baby and the mother are progressing. We turned down all the other tests and genetic screening, but taking a closer look at our little one and Jodi, especially given the size of our babies, seemed like a good idea. 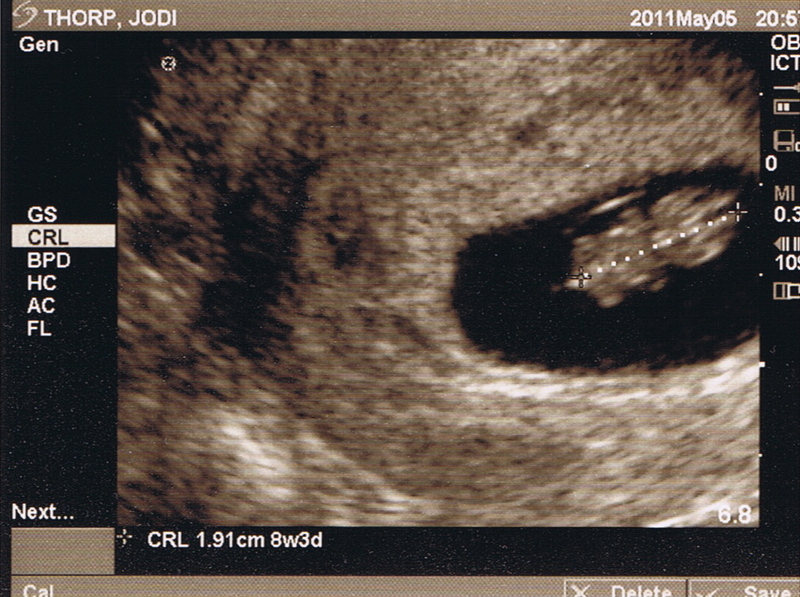 These show our baby at just eight weeks of development. We’re looking down on him or her from above, with an absolutely Thorpian head to the right, and a torso with four tiny limbs extending to the left and down in the lower image. This was a thrill, not only because we lost a little one last fall and were hoping for an “all systems go!” from our doctor, but because there on the screen was a tiny person, less than two centimeters long, with a beating heart and legs and arms that moved independently of any thought or command from Jodi or me. A child the size of my fingertip who, just before Christmas, we will be blessed to welcome and trusted to raise. Some people say miracles are impossible; others believe they happen, but only rarely. I believe miracles happen daily, all across the world. I’ve got photographic proof. As we drove home from the earlier ultrasound, I was reminded of an extended argument I had once, on a political blog in South Dakota, with a staunch and pseudonymed liberal who dismissed me and two of my friends as Bible-thumpers for being against abortion. I explained to him that, on the contrary, I studied physical anthropology and human evolution in college and was anti-abortion well before I became a practicing Catholic. I articulated to him a set of arguments against abortion, completely independent of religious belief or church doctrine, and asked, then begged, then dared and taunted, him to engage me on them. He would not. “Which part of their body is it?” I asked. An abortion removes something from a woman’s body, without a doubt. If what is removed is her, or some part of her, then it should share both her gender and her genes, and she should be somehow physically diminished, something less than the whole and functional woman she was before the procedure. If she had her gallbladder removed, for instance, or a toe, a mortician or coroner might note such a thing upon her death. This was made clear again to me when I saw our tiny infant, wriggling in amniotic bliss, at eight weeks of development. Jodi had no say in the flailing of those tiny arms and legs, and that tiny heart beat in part because of, but not for, her. No choice on her part, short of violence, could have stopped it. And of course, it was made clear yet again today when we saw that beautiful profile at the top of this post. There’s a reason that the Knights of Columbus and other Catholic and pro-life organizations are investing in ultrasound machines for clinics and teaming with expecting mothers to show live ultrasounds of their babies to middle- and high-school students. There’s no better way to recognize the humanity of others than to see them face to face. Wonderful! And you have the most thoughtful argument against abortion of anything I have ever heard or read. Hope you do post it all on here again, so I can either copy and send or send people to read it themselves. Maybe that is one of your missions in life. You of the well spoken and written word! Have you thought of a name for the baby yet? Thank you, Jinglebob. I will work on the other aspects of what I wrote back then, and post them in the coming weeks…or at least that's the plan. We do have names tentatively picked out: for a girl, Lillian Clara (Clara for Jodi's paternal grandmother, Willamena Clara (Sprenger) Venjohn), and for a boy, Samuel Firman (Firman for Jodi's maternal grandfather, Firman James Coyle). Jim as always I am blown away with your insight spirit and faith. I am very happy for you and Jodi and I pray you will be kept in good health for the duration of this and possibly others. Stay strong and as always God Bless. Congrats again to your beautiful wife, and you ofcourse… I love ultrasounds… Exspecially when u get to hear the heart beat.. That is the best.. It goes so fast, its crazy… I like the names as well..